If there is one thing that you are guaranteed to encounter in a cyclocross race it is corners. Today we are going to discuss the technique of cornering. By knowing how to take corners quickly, you can be guaranteed faster lap times and will be able to conserve energy (double bonus). Cornering may seem like a skill not worth mentioning; after all, we all know how to turn our bikes. But cornering fast, on grass, mud, and dirt isn’t always as easy as it seems. Take a look at a typical Cat 4 race, which is about 45 minutes long. Usually the difference between first place and 10th place is less than a minute. A technical course could have as many as 20 corners (conservative estimate) in 5 minutes. Now let’s imagine you and another rider with the same power output. Let’s say this other rider takes a corner .5-1 sec. faster than you. That adds up to 1.5-3 minutes by the end of a 45-minute race. Now if that doesn’t get your attention and make you want to jump on your bike and start doing ovals and figure eights until you’re as dizzy as me when I get off the roller coaster with my kids, I don’t know what will. Stop pedaling and stand up off the saddle. Apply most of your weight to your pedals (your cranks should be in the horizontal position). Relax your shoulders and relax your grip on the bar. Yes, relax your grip on the bar. Scrub some speed while the bike is still straight up and down. Note: YOU SHOULD NOT BE USING THE BRAKES WHILE CORNERING AT ALL (and if you do everything right you won’t have to unless something unexpected comes up). If you don’t know what speed is right then go a little slower. This is one skill that will only improve with time. Enter the corner and drop your OUTSIDE pedal down and put all your body weight on that foot. Drop your outside heel below the pedal (pretend to drag your heel on the ground, you will never be able to, but it will feel like you are going to). Note: This is very important, as it will help position your hips and upper body correctly. It will position your center of gravity on the bottom bracket. Lean the bike (not your body, just the bike) into the corner. This means your inside arm is going to be straight and pushing the bar down into the corner, and your outside elbow is pointing outward. Note: If done correctly your bike will be leaning towards the corner, but your body and hip will be directly over the bottom bracket giving you the most traction and the best position to go through a corner fast. Turn your inside knee towards the inside of the corner, this will naturally turn your shoulder towards the inside of the corner as well. 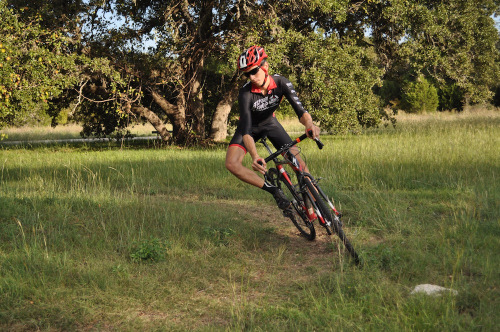 Start looking past the corner and forward down the course (remember rule #1 in off road biking: look where you want to go, and the bike will follow). Start pedaling and increase your speed. See the photos below as a demonstration of the proper technique. Step 2 – Drop your outside leg down and shift your weight to that foot. 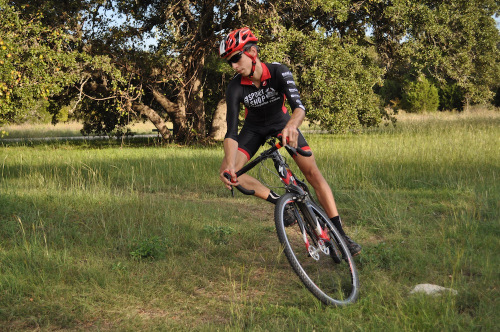 Step 3 – Lean the bike but try to keep your body as upright as possible. Step 4 – Begin to un-lean the bike and start pedaling. So what happens when the corners are off-camber or you have to turn uphill when you are going downhill? Well then you can’t really lean the bike into the turn or the bike will literally slip out from under you. The only thing that changes from steps 1-4 above is step 3. This time, for step 3, instead of leaning the bike into the corner, you will lean your body into the corner and try and keep the bike more upright (to increase contact patch of your tires with ground). Lean your body into the corner while trying to keep your bike as upright as possible. If the conditions are super muddy or soupy your best bet is to play it defensively. Meaning it’s better to go slow and stay on the bike than try and go fast and fall at every corner and spend precious time and energy getting back on the bike. So slow and steady in this case CAN win the race. In dry conditions you lean the bike into the corner, in muddy and slippery conditions that’s the last thing you want to do. When you lean the bike you have less contact patch on the ground essentially making it easier to loose traction and slide. So slow way down and turn slowly and cautiously. If the corner is off-camber and very slippery, unclip your inside foot and be ready to use it to keep you from falling down. Whenever possible try your best to pedal through the corner at a low cadence. This can help increase traction but you have to be careful, use a harder gear and pedal slowly. Finally if the corner looks really messy and everyone in front of you is falling down attempting to ride, then do the smart thing and get off your bike and run/walk through it. After all it’s a cyclocross race and there is no shame in getting off your bike, especially when you’re running past all those others trying (and failing) to ride through the corner. The motor (your leg strength and power) is very important in winning the race, but you can lose the race by not cornering well. Remember the example I used at the beginning showing you how you can easily lose minutes in a race just by going slower through the corners from lack of skills. The best time to practice the skills is right after your warm-up and before your main set on hard days when you are supposed to ride off road. Find a parking lot, or grassy area with a couple of trees (or put a couple of rocks about 30 feet apart). Remember to practice all skills slowly at first and then gradually increase speed as you build your skill and confidence, no one can improve skills by going fast at first. Use the trees or rock or marks. Pedal during the straight part. Then stand up and get into your READY POSITION (Step 1) as you approach the corner. Take the corner making sure to drop your outside heel and look at the next corner. As you come out start pedaling toward the next corner. Do this about 10 times (or until you get really dizzy), trying to make tighter and tighter turns and feeling smoother and going through a mental check of all the points mentioned through every corner (ready position, reduce speed, drop outside leg down, push the bike into the corner, look at the next corner, etc.). Take a short break and repeat the same thing in opposite direction. You will find that it’s more natural turning in one direction vs. the other. I won’t go into muscle function and all that, but make sure you practice your unnatural side just as much, if not more, than your natural side. Note: For something different, try doing a figure eight around your turning points instead of an oval. If you are getting passed through the corners in the race, then you need to practice cornering about 3 times a week, and after two weeks you should start noticing the difference in the race. If you need more explanation of the skills feel free to reach out. 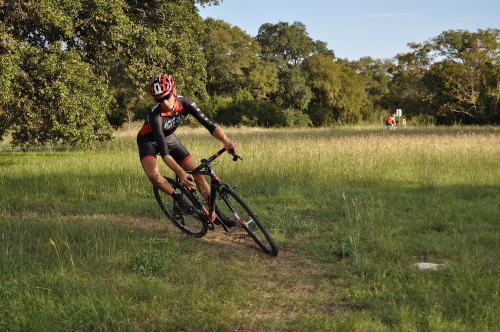 For more cyclocross related workouts from coach Sean, checkout Transition to Cyclocross – Part 1 and Transition to Cyclocross – Part 2.